Okay… cue the Twilight Zone music. 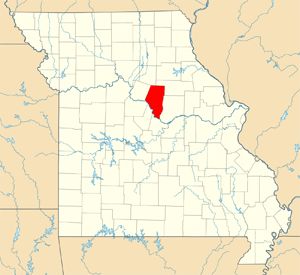 The Legal Genealogist is in Columbia, Missouri, for the Annual Conference of the Missouri State Genealogical Association (MoSGA) and wondered, just for the heck of it, if there was some family connection to Missouri that could be highlighted today. I try to write something about my family every Saturday and, even though I knew I didn’t have any direct ancestors who came from Missouri, I figured there had to be something in my own family history that would link me to the Show Me State. And, sure enough, looking at the master place list in The Master Genealogist software that I use, I came across an entry for a distant cousin who was connected to Missouri. I looked a little closer, and found that he was connected to Boone County, Missouri, shown on the inset map. And looking a little closer still, he was connected to Columbia, Missouri, which is in Boone County. Now Eli and I would be second cousins four times removed. Not exactly the closest of relatives, but hey… considering the odds of getting a family hit not just in the same state but the same county and even the same city, that’s quite a bit of serendipity, isn’t it? And, you see, next weekend, I’ll be speaking at the Northwest Genealogical Conference. Now go ahead and cue that music, okay? Serendipity, deja vu, somebody had to put a name on these things that happen we can not seem to explain. Even in the world of genealogy, it seems like some lives seem to run a close parallel to an ancestor. So, when that music is queued up, it may sound a little like the Twilight Zone. Having entered the above reminded me of my grand son-in-law. We did his genealogy research for him. He has an EE degree from the University of Colorado. He knew nothing about his grandfathers and any of his family history. 2 of his grandfathers were engineers in the 1800’s. So cue that music. Looking forward to seeing you at the NWGC! Great magical parallels, Batman! Those are some crazy connections! Let me know if you find Phoebe Snodgrass’s parentage, though. My partner is descended from Snodgreaa folks in that region: James, David, William…any of these connect with Phoebe?? I haven’t thoroughly researched the Snodgrass line, but the Clan Snodgrass site in the footnotes should give you some leads! *Phoebe Snodgrass. Sorry, my typing overlapped other stuff and I couldn’t see what I typed. Mea culpa.